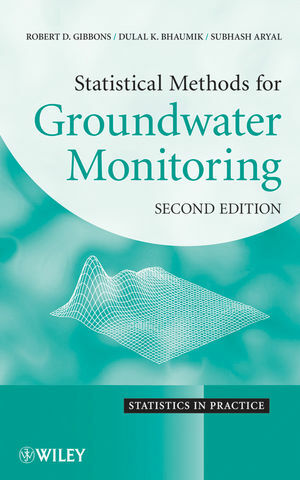 Thoroughly updated to provide current research findings, Statistical Methods for Groundwater Monitoring, Second Edition continues to provide a comprehensive overview and accessible treatment of the statistical methods that are useful in the analysis of environmental data. This new edition expands focus on statistical comparison to regulatory standards that are a vital part of assessment, compliance, and corrective action monitoring in the environmental sciences. Each chapter provides a general overview of a problem, followed by statistical derivation of the solution and a relevant example complete with computational details that allow readers to perform routine application of the statistical results. Relevant issues are highlighted throughout, and recommendations are also provided for specific problems based on characteristics such as number of monitoring wells, number of constituents, distributional form of measurements, and detection frequency. Statistical Methods for Groundwater Monitoring, Second Edition is an excellent supplement to courses on environmental statistics at the upper-undergraduate and graduate levels. It is also a valuable resource for researchers and practitioners in the fields of biostatistics, engineering, and the environmental sciences who work with statistical methods in their everyday work. Robert D. Gibbons, PhD, is Director of the Center for Health Statistics and Professor of Biostatistics and Psychiatry at the University of Illinois at Chicago. A Fellow of the American Statistical Association and member of the Institute of Medicine of the National Academy of Sciences, Dr. Gibbons has written more than 200 journal articles in the areas of statistics and psychometrics. He is the coauthor of Longitudinal Data Analysis and Statistical Methods for Detection and Quantification of Environmental Contamination, both published by Wiley. DULAL K. BHAUMIK, PhD, is Professor of Biostatistics, Psychiatry, and Bioengineering at the University of Illinois at Chicago. A Fellow of the American Statistical Association, Dr. Bhaumik has published more than fifty journal articles in his areas of research interest, which include environmental statistics, statistical problems in psychiatry, biostatistics, design of experiments, and statistical inference. SUBHASH ARYAL, PhD, is Assistant Professor of Biostatistics at the University of North Texas Health Science Center at Fort Worth. He has coauthored numerous published articles on statistics in the environmental sciences. 1.2 Prediction Intervals for the Next Single Measurement from a Normal Distribution. 1.3 Prediction Limits for the Next k Measurements from a Normal Distribution. 1.4 Normal Prediction Limits with Resampling. 1.5 Simultaneous Normal Prediction Limits for the Next k Samples. 1.6 Simultaneous Normal Prediction Limits for the Next r of m Measurements at Each of k Monitoring Wells. 1.7 Normal Prediction Limits for the Mean(s) of m > 1 Future Measurements at Each of k Monitoring Wells. 2.2 Pass 1 of m Samples. 2.3 Pass m - 1 of m Samples. 2.4 Pass First or all m - 1 Resamples. 2.5 Nonparametric Prediction Limits for the Median of m Future Measurements at each of k Locations. 3 PREDICTION INTERVALS FOR OTHER DISTRIBUTIONS. 3.3 Lognormal Prediction Limits for the Median of m Future Measurements. 3.4 Lognormal Prediction Limits for the Mean of m Future Measurements. 4 GAMMA PREDICTION INTERVALS AND SOME RELATED TOPICS. 4.3 Comparison of Gamma mean to a Regulatory Standard. 7.3 A Statistical Estimate of the PQL. 7.4 Derivation of the PQL. 7.7 The Effect of the Transformation. 8.2 General Random Effects Regression Model for the Case of Heteroscedastic Measurement Errors. 8.3 Estimation of Model Parameters. 8.4 Applications of the Derived Results. 10.4 Combined Shewart-CUSUM Control Charts. 12.4 Restricted Maximum Likelihood Estimators. 12.9 Substitution of Expected Values of Order Statistics. 13 NORMAL PREDICTION LIMITS FOR LEFT-CENSORED DATA. 13.1 Prediction Limit for Left-Censored Normal Data. 14 TESTS FOR DEPARTURE FROM NORMALITY. 14.2 A Simple Graphical Approach. 14.6 Methods Based on Moments of a Normal Distribution. 14.8 Testing Normality in Censored Samples. 18 ASSESSMENT AND CORRECTIVE ACTION MONITORING. 18.4 Normal Confidence Limits for the Mean. 18.5 Lognormal Confidence Limits for the Median. 18.6 Lognormal Confidence Limits for the Mean. 18.7 Nonparametric Confidence Limits for the Median. 18.8 Confidence Limits for Other Percentiles of the Distribution. 19.2 Methods to be Avoided. 19.4 Interwell versus Intrawell Comparisons.